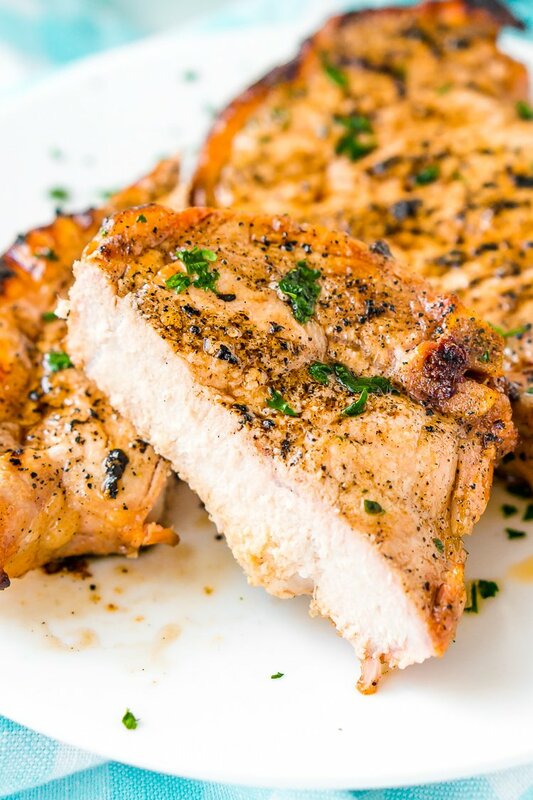 This Pork Chop Marinade makes meat juicy, tender, and super flavorful. Made with apple cider vinegar, olive oil, garlic powder, ground mustard, coriander, sea salt, brown sugar and honey, you can whip it up for summer cookouts or weeknight dinners. Grilled meat is always delicious, but marinated grilled meat is even better! If you’re not already a fan of pork chops, you will be — this zesty Pork Chop Marinade is a total game changer! 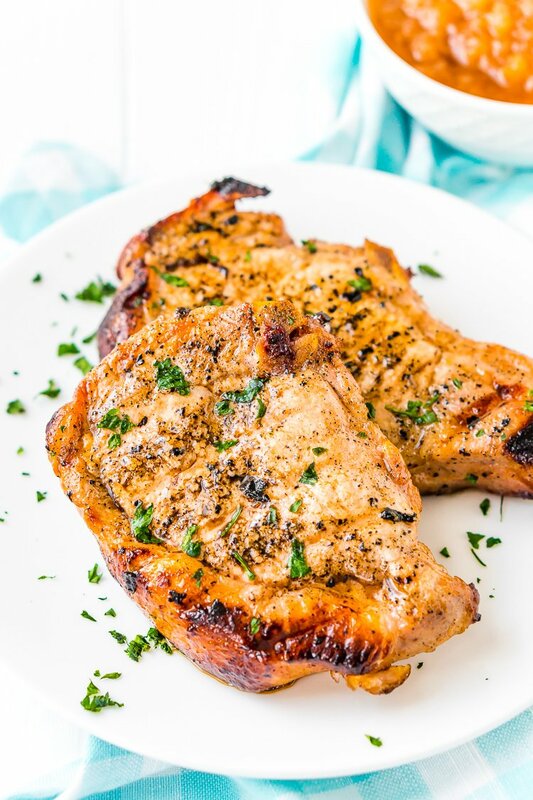 Slightly sweet with savory spices and a tangy kick, this marinade for pork chops will make the meat tender, juicy, and fill it with mouthwatering flavor. Made with apple cider vinegar, olive oil, garlic powder, ground mustard, coriander, sea salt, brown sugar and honey, the flavors of this made-from-scratch marinade covers all the bases! I love how simple this recipe is to throw together, and most of the ingredients are staples that I always have in my kitchen. Given the choice, I’d choose a homemade marinade over a store-bought one any day, since it’s usually healthier, cheaper, and of course, it tastes better! Summer is grilling season and a time to enjoy cooking and eating outdoors with friends and family! Plus, who wants to turn on the stove and make their house stuffy on a hot day? 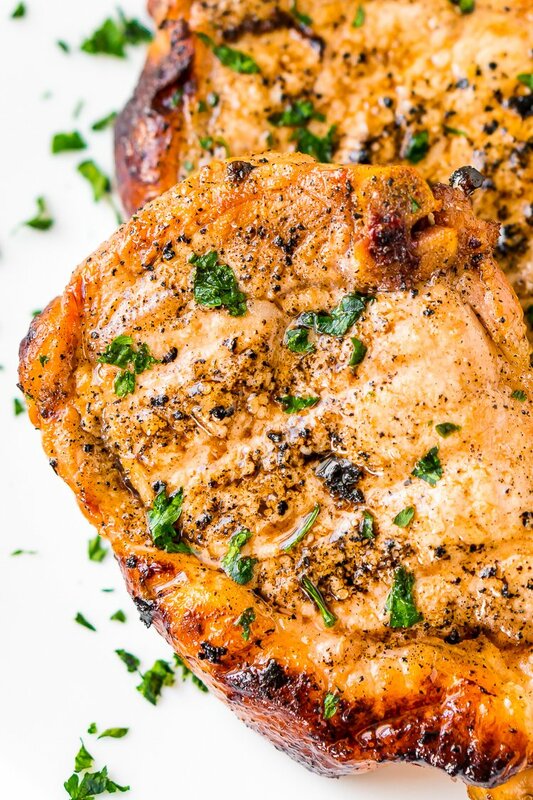 This grilled Pork Chop Marinade can inspire an easy-to-prepare meal for cookouts, parties, or any weeknight at home with the family. Just start marinating the pork chops the night or morning before you cook them, and when it’s mealtime, all you have to do is cook them. We love cooking ours on our Traeger Grill because it adds an additional layer of smoky flavor, but you can cook these on any grill or in the oven! How Do You Marinade Pork Chops? Marinating Pork Chops is really easy to do and totally work it for the delicious flavor that results! Simply whisk the marinade ingredients together in a bowl, add the pork chops to a large Ziploc bag and pour the marinade over them. Squeeze all of the air out of the bag and work the marinade to make sure it’s coating all of the pork chops, place in the refrigerator to marinate until ready to cook. How Long Do You Need To Marinade Pork Chops? This recipe is good for 2-3 chops, and as usual, the longer they marinate, the tastier and more tender they’ll be. Letting them sit for 24 hours is ideal, but 8 hours will still give you delicious results. Can I Use Marinade As A Sauce? Technically, you can, but you would need to boil it for about 5 minutes to remove any bacteria. Remember, this marinade was used on raw meat and you don’t want to use it over freshly cooked pork chops. Personally, I recommend enjoying these without sauce or another sauce of your choosing. Pin this Pork Chop Marinade Recipe for Later! 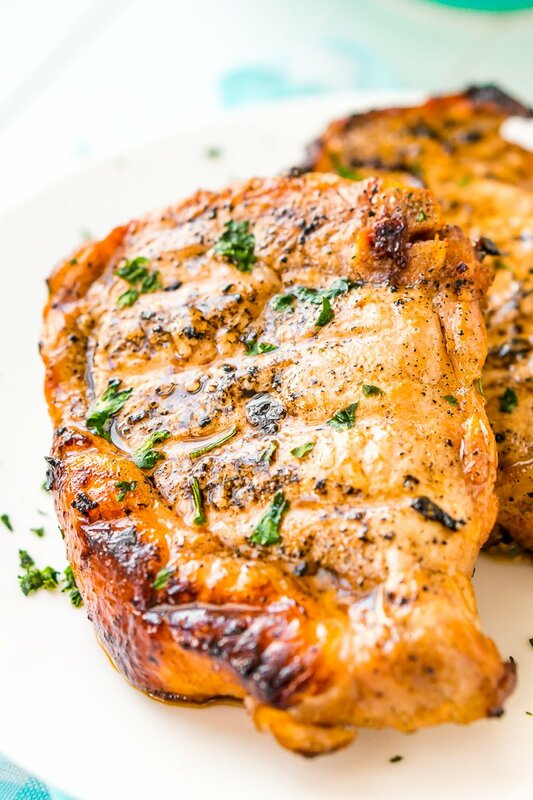 Switch up your grilling routine with some juicy and flavorful pork chops while the weather is warm! 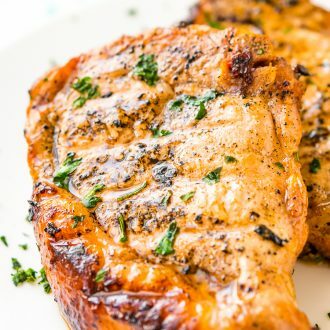 This simple homemade Pork Chop Marinade recipe will make pork chops a family favorite for those balmy summer evenings. Please note that we’re just a family of two, so the base recipe is only for 2 to 3 pork chops and will need to be doubled or tripled for larger batches! Whisk together the ingredients in a medium bowl. Pour over 2 to 3 pork chops into a large Ziploc bag and squeeze all of the air out. Seal and marinate in the fridge for 8 to 24 hours before cooking as desired. This marinade makes enough to marinate 2 to 3 pork chops, for large batches double and triple the recipe. These chops look great. I always use apple cider vinegar to make meat tender. Yes, it makes such a difference! Do you use BOTH apple cider and apple cider vinegar? Ingredient list indicates this, but paragraph of description above it does not mention apple cider. Hi Teresa, yes, the recipe uses both. 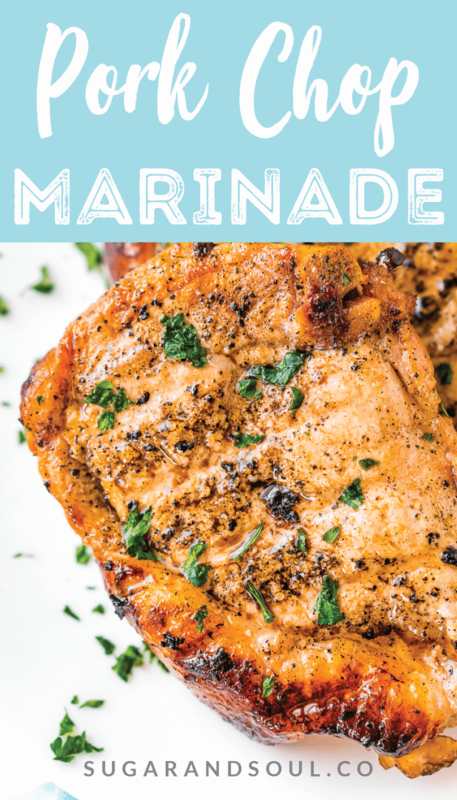 Such a great marinade and I love that it’s not too complicated and doesn’t require a bunch of ingredients! Exactly and most of them you probably already have! I love pork chops, but you can only make them one way so many times before you get tired of eating them. This marinade looks delicious! Can’t wait to try it. I hope this adds a little extra zing to what I know can be a mundane weeknight meal!